Writer/director Vito Trabucco is best known for his low budget horror comedy Bloody Bloody Bible Camp and it is absolutely no secret that I have a very special fondness for that film. Horror comedy can go so badly so quickly, but Trabucco manages to walk the line well. 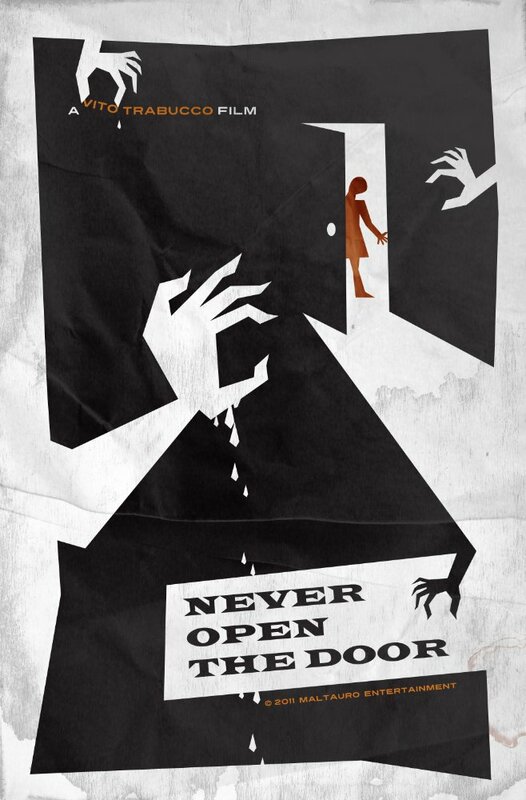 His latest film, Never Open the Door is a love letter to classic shows such as The Twilight Zone and Outer Limits. Although tonally different, there are moments of classic Trabucco humor in this throwback of black and white horror/sci-fi mash up. Three couples have gathered at a secluded cabin for a holiday meal. Everyone knows that nothing good happens in secluded cabins, so it doesn’t take long for this idyllic dinner to be thrown off of the rails. Comprised mostly of Bloody Bloody Bible Camp alums, our couples all have a bit of an edge to their otherwise vanilla looking exteriors and this will come into play after a mysterious stranger knocks on the door. The moment they all realize that no one is sure who actually reserved this cabin, they are interrupted by an unexpected guest who vomits blood onto one of our girls and everything goes downhill from there. This stranger points at Terrence and says, “Never open the door,” but Terrence has no idea who this man is. At just over an hour, Never Open the Door explores themes of paranoia, jealousy, mistrust and fear all while maintaining a cheeky sense of humor and playing with the fluidity of time. From the retro cool opening credits, to the spot on score and excellent use of light and shadows, this is a wonderfully fun ride through old timey television nostalgia with some supremely eerie visuals. Made on a modest budget, the indie/low budget feel is exactly what puts the bow on top of this wonderfully unexpected package.